If you’re anything like me, then when you do something for the first time, you like to make it as complicated as possible. Case in point: making a sour beer. Sour beers get sour by adding bacteria that converts sugars into various acids. Lactic acid is most common in sour beers, providing a clean, lemony taste. However other acids that could be found include malic acid; which tastes like sour apples, acetic acid; which is basically vinegar, and butyric acid; which is similar in aroma to bile. The bacterias and wild yeasts that create these acids (namely lactobacillus, pediococcus, sherry flor, and brettanomyces) can very easily be purchased by a number of yeast labs. But I thought it would be more fun to culture my own lactobacillus. WARNING: long-winded, microbiology filled post! Lactobacillus (henceforth known by it’s more common street name: lacto) can be found virtually everywhere, including inside the human body. Lacto is also what’s used to sour milk into yogurt. In fact, I’ve read that you can even use yogurt as a lacto starter to add directly to beer. I decided instead to use a more practical source: malted barley. Most people don’t realize that malted barley is covered in lacto because during the brewing process, it all gets killed in the boil. However, it is for this reason that breweries keep their grain in a separate room from their fermentors. If any of that lacto were to make it into any of the racking, or packaging equipment, the entire batch of beer would be spoiled. Whatever your choice for medium is, you want to ensure that the temperature is in the ideal range for lactobacillus growth. Lacto is most active in temperatures between 100-120 F. Boil your choice of medium for about 15 minutes to sanitize it (yes, the goal is to grow wild bacteria, but you want to ensure that you are growing the right kind of wild bacteria, not just any bacteria). Be sure to also sanitize whatever vessel you choose to store it in after the boil. Next, cool it down to somewhere between 100º F and 120º F. Here’s where it gets tricky, you need to keep it at that temperature for a few days. Living in Las Vegas, this was easy: I just kept it outside where right now the weather is at least 80º at night and about 105 in the middle of the day. Add about a handful of malted barley into the solution. Whatever vessel you put it in, do not cap or seal it! If you start growing a heterofermentative strain of lacto, which you probably will, it will build up pressure and cause the vessel to explode. I wrapped sanitized tin foil around the top of the bottle that I used. It keeps anything from getting into the starter, but will still allow pressure to be released should it start increasing. I’ve read a few people online state that the resulting starter should smell like lemon juice, and should never smell putrid, otherwise it indicates the wrong kind of bacterial growth. I’ve also read that it will undoubtedly create the most foul smelling thing that you’ve ever smelled, and that it’s completely normal and not to worry. Sure enough, I made my starter in the morning and that night I checked on it, and it smelled like rotten vegetables. More specifically, like really strong dimethyl sulfide (DMS). S-Methyl Methionine (SMM) is an amino acid present on malted barley that is formed during germination. When you get SMM hot, it creates DMS. This is why it is important in brewing to boil for at least 60 minutes, and to cool the beer as quickly as possible: you are trying to boil off as much SMM as possible and prevent it from forming DMS in the finished beer. Leave a bag of spinach in your car all day during the summer and you will know what DMS smells like. Or, it can often times smell like creamed corn. I found the smell of my starter disturbing, but I didn’t worry too much about it, since I assumed the SMM on the barley had turned into DMS due to the temperature. The next day the rotten vegetable smell dissipated and it turned more into a creamed corn smell. It’s a better smell, but still not ideal. Either way, I dreaded having to tasting it and subsequently add it to my beer. Then, about 60 hours after making the starter, I checked on it and the creamed corn smell was gone! Instead, it smelled sharply sour, and a bit lemony. 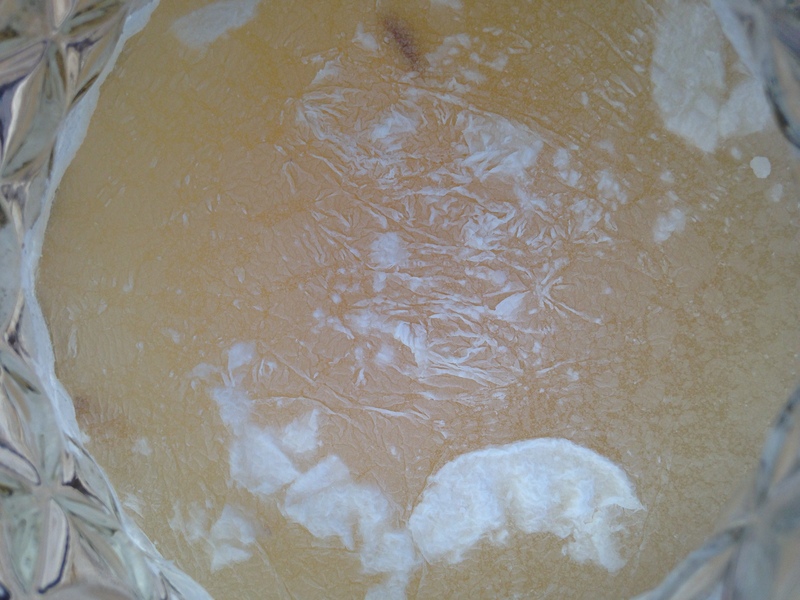 At this point, I noticed a thin white pellicle starting to form on the surface of the starter (above photo). 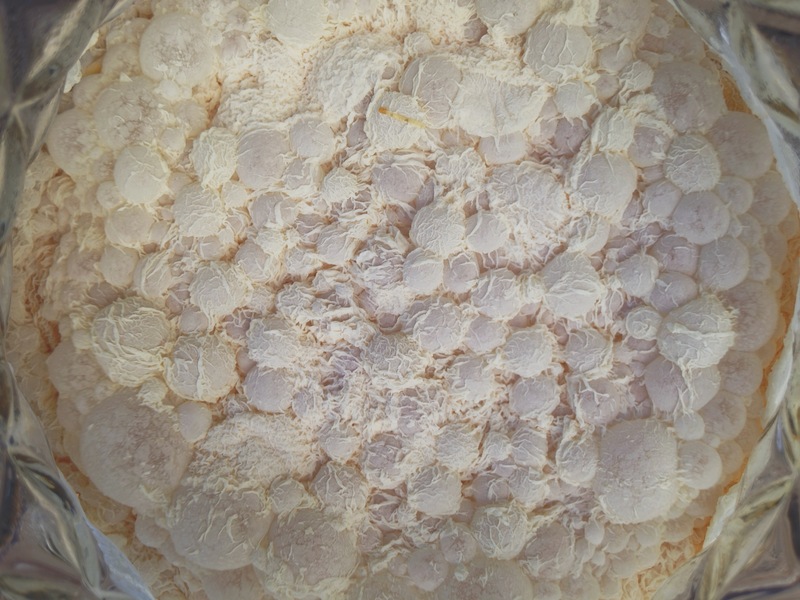 I get mixed answers on whether lacto creates a pellicle, or if instead it’s actually a sign of brettanomyces. Either way, it should always be white. Green or blue indicate mold growth, which is not at all what you are looking for. By the next morning the pellicle was very large and bubbly (see topmost photo). One thing that I noticed when checking on the starter, was a small amount of bubbles rising up through the starter and collecting at the top. This is a sign of a heterofermentative strain of lactobacillus, versus a homofermentative strain. A homofermentative strain would convert sugar into only lactic acid. A heterofermentative strain would convert sugar into lactic acid, carbon dioxide, and/or ethanol. The reason to keep this in mind, is because when taking gravity readings, they may not be 100% accurate when figuring out the alcohol content if a heterofermentative strain was used, as this would lower gravity, but not necessarily because of an increase in alcohol. There’s a very wide range of lactobacillus strains, each differing in how it metabolizes different sugars. Additionally, because heterofermentative strains create more byproducts than just lactic acid, less lactic acid is created then when compared to a homofermentative strain. 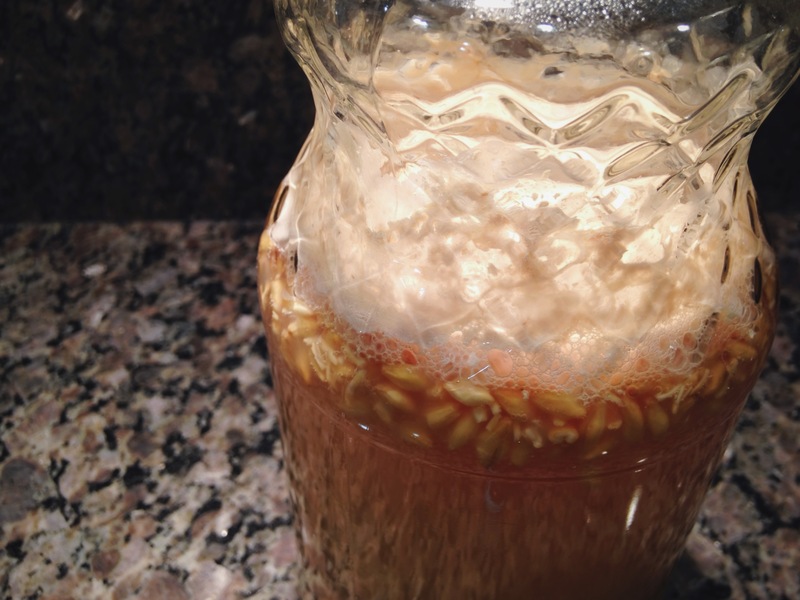 By culturing lacto off of grain, it is very likely that there are multiple strains being grown, however you would need a microscope and and a good idea of what the hell you are doing to actually know what is going on in there. I don’t have the equipment to do cell counts and tell you exactly when the starter is ready to pitch into a beer. I would assume that once the smell is pleasant, it’s likely safe. Depending on how you intend on using the lacto would be a factor on what pitching rate you would want to have. I planned on using this in an upcoming sour beer. I’ve never done this before so going into all of this, I had no idea what would happen. As of this time the beer is still fermenting, but thus far I can say that I either got a super heterofermentative lacto strain, or I also grew quite a bit of some sort of wild yeast.